It has officially been one year since I was in the Rio Grande Valley. I better hurry up and post this. All my social media feeds are full of amazing photos of amazing birds and wonderful friends who were lucky enough to be able to go back this year. I will return some day until then...Day Seven. We woke up up before the sun on our last full day of birding with the intention of heading West. We'd seen pretty much all the birds there were to see in the Rio Grande Valley near our home base in San Benito. Short of something insane like an Amazon Kingfisher showing up, we needed new territory. Our host Claire told us she had actually seen an Amazon Kingfisher once in a resaca near her house. She was a new birder at the time and even though she had photos and other people saw it, the records committee had never approved her sighting. "Prove me right boys!" She'd say as we headed out birding each day. We weren't about to spend our day searching resacas for a bird that had only officially been reported in Texas once in recorded history. Our plan was to head to Salineno and then on to Falcon State Park to pick up birds in a dryer, more western habitat. We grabbed some breakfast tacos at the gas station and drove about two hours west in hopes to be in Salineno by daybreak. A few wrong turns and some construction meant we got there a hair later than we had hoped. We failed to see any Red-billed Pigeons or Muscovy ducks flying on the river and so we were starting the day off with two misses. We did see a flock of Pyrrhuloxia on the road down to the river and ran into some other birders so at least that seemed like a good start. Things got even better the more we settled in and searched. There is a little nature preserve there right on the river where a wife and husband keep feeders well stocked. We chatted with them as they put out seed, peanut butter and oranges. They told us the best place to wait so I sat down and didn't move. In just a few minutes, a Hooded Oriole showed up. What a beautiful bird. It was the first time I had ever seen one so I was pretty excited. They are beautiful. The woman who maintains the feeding station pointed out that she could hear a single note from an Audubon's Oriole as well so we patiently waited. Soon I could hear it too as it got closer and closer. Before too long a male announced his arrival at the fence just 10 feet in front of me and started to chow down on peanut butter. This is an incredible bird. Gorgeous! Who knew orioles like peanut better so much? We usually stick to grape jelly and oranges up in Minnesota. While waiting for these two to show up, my first Plain Chachalaca's showed up as well. Three lifers in a matter of minutes! I was thinking we had made a good choice on coming west. We then went back to the river and soon got wonderful full scope views of a Ringed Kingfisher, also a lifer and of course new for the trip. It wasn't until months later that I got around to reading the book, A Supremely Bad Idea by Luke Dempsey in which he tells the tale of being confronted and threatened by drug runners at the exact spot where we were scoping the kingfisher. I'm grateful our visit didn't involve drug runners or someone trying to take my camera. We felt like we'd seen everything we could see in Salineno, including a roosting Screech Owl so it was time to leave. We had plans to head to Falcon State Park as well for other species. I'd turned off my mobile phone when we got to Salineno because we were so close to Mexico that I could not get a US carrier, only a Mexican one, and didn't want to incur any roaming fees. When we got back up to the highway I turned my phone back on and suddenly received a flurry of text messages from pretty much everyone I had met at the festival. At this point I recall a lot of swearing in the car. Here we were 2+ hours west of Harlingen tracking down western species and one of the rarest birds possible shows up back where we had left from. We still had species to pick up out west and it was only lunch time. Given the intel we had on the bird we hedged our bets and went to Falcon State Park for an hour. We were gambling the kingfisher would still be there in the afternoon. At the park we fairly quickly saw Roadrunner and Couch's Kingbirds, both lifers for me. We didn't see any Scaled quail or Ash-throated flycatcher and decided we needed to leave, we just couldn't risk missing the kingfisher. 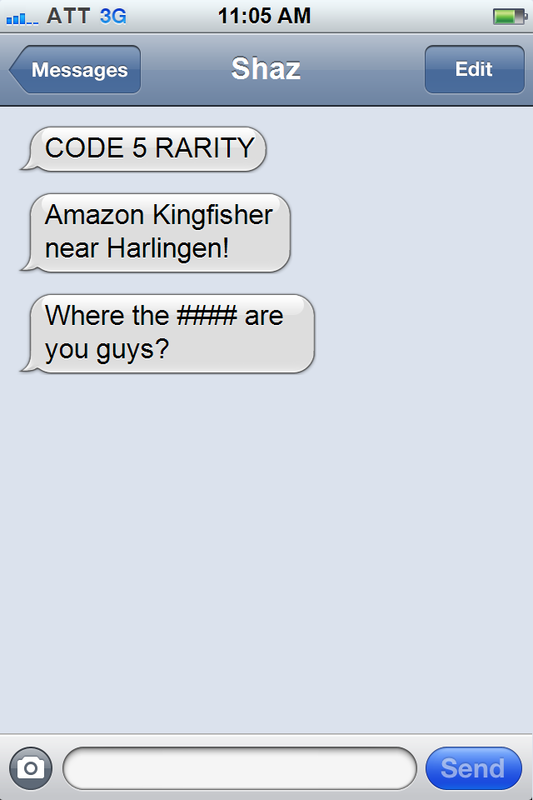 All the while we were getting texts every 15 minutes from people at the conference..."Kingfisher still here." Before we could get to the kingfisher spot though, we needed lunch and that brings us of course to demons. Bear with me. These are all cases of pareidolia. The animal brain is a constantly running pattern recognition machine. It is an incredible evolutionary tool that has allowed us to survive. It errs on the side of caution and often sees patterns where they do not exist. When it comes to recognizing a tiger in the jungle it is better to err on the side of caution more often than not. We are the descendants of the paranoid survivors. When we see seemingly familiar patterns in food or clouds or wood grain you have a choice. You either believe in the wonderful, awe-inspiring millions of years long evolutionary story of the human brain or, perhaps the grandeur of that isn't enough for you and you choose to invoke paranormal explanations that these random patterns are the handiwork of God. 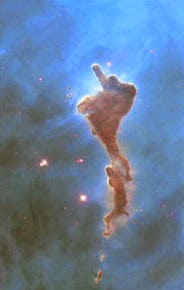 Though, I have to warn you, if you believe the latter than we have to assume God really is flipping us the bird in this deep space photo taken by NASA. Photo courtesy of NASA. A small cloud in the Carina Nebula. Our final full day of birding we were present at a truly awe inspiring sign from the birding gods (or, you know, pareidolia). First though, we have to address gas station tacos. Two days previous we'd been out birding with Kelly and she'd suggested we go looking for hawks at Anzulduas Park. It was a crappy cold day and the hawks knew it. We didn't see hardly anything. Cold and hungry, we loaded back into the car and made lunch plans. We wanted Mexican food and so it was our smart phones to the rescue. Curt pulled out his phone and informed us there was a highly rated restaurant just 5.3 miles away. Perfect. We followed the directions only to discover the restaurant kept getting further and further away. Next time we asked it was 6.8 miles, soon, it was 15 miles. We checked and we were headed the right way but this mysterious restaurant defied the laws of physics and kept getting further. We eventually made it to the 5.3 mile away restaurant after about 25 minutes. Curt's phone was new and I suspect the miles he kept reading were the miles to the next turn instead of the miles to the final destination. We got there and after the meal Kelly told us that it was okay but that we'd paid too much. "Oh really?" "Yes," she told us. "The best tacos you can get are way cheaper." Kelly then went on to tell us that the best tacos are the ones at the gas station. You have got to be freaking kidding me. Minnesota gas stations pretty much have one hot food item and that is shriveled up hotdogs on a roller grill. This is Texas though, what do I know? Maybe the cheap tacos at the gas station really are great. The price is right, you get your food fast and if they taste great then so be it. We'd learned that if you doctored them up with enough fixings then they did, indeed, taste pretty good. So, we ate a lot of gas station tacos and we figured we'd stop on the way to the Amazon Kingfisher. We needed food so we pressed our luck and stopped to grab some quick chow. As one of the workers was heating up the tortilla shells she let out an exclaim of surprise. Wow, just wow. 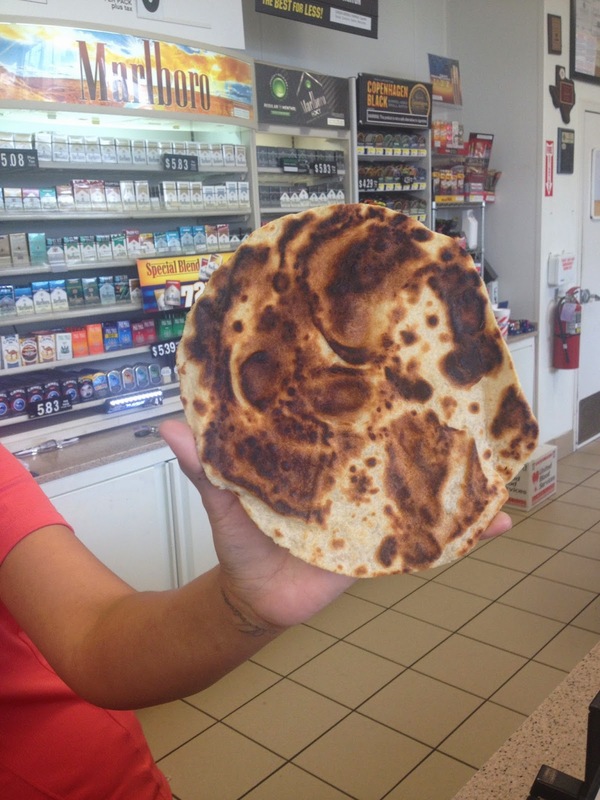 Check out this tortilla. That's a human skull wearing a top hat right? Filled with tasty demon-approved tacos and armed with directions to the spot with the kingfisher we tore back east and made it there by 4:30 pm. There was still a large crowd though not as many as earlier in the day. Still, the police were out directing traffic to make sure no one got killed as they ran around on the side of the road. Apparently the sheriff had told the officers, "Keep everyone safe and make sure they have a good time." How's THAT for hospitality? It doesn't hurt that everyone here knows birders do a lot for the economy. It wasn't that great a look. We waited, and luckily the bird eventually flew closer and I got the shot below. If it had hung around longer I could have played with the camera setting to get a better shot but, wow, what a cool bird. Look at that honkin' huge beak! It was our last day of birding in Texas and I was happy to have added 8 more lifers. I never thought I would cap it off with an Amazon Kingfisher. In the final tally I saw 155 species of birds in 7 days of birding. Forty-eight of them were lifer species I'd never seen before. It was a fabulous trip and I can't wait to go back.